Awesome-Promos pretends to be a useful browser add-on that helps you save money on shopping deals, but that is a translucent cover we can see right through. Unfortunately, your money will not be saved if you have this annoying application on your computer; nevertheless, by the third-party advertisements it may start to spam your screen with it may introduce you to unsafe web content. We have found that this is just a new attempt to make easy money through misleading advertising. As a matter of fact, this application belongs to the notorious Multiplug adware family. Its presence can easily mean the presence of other malware infections as well; therefore, it is a multiple security risk. We suggest that you remove Awesome-Promos as soon as possible. If you continue reading, you will learn more about this infection and how you can make it go away. Awesome-Promos does not even have a decent website. 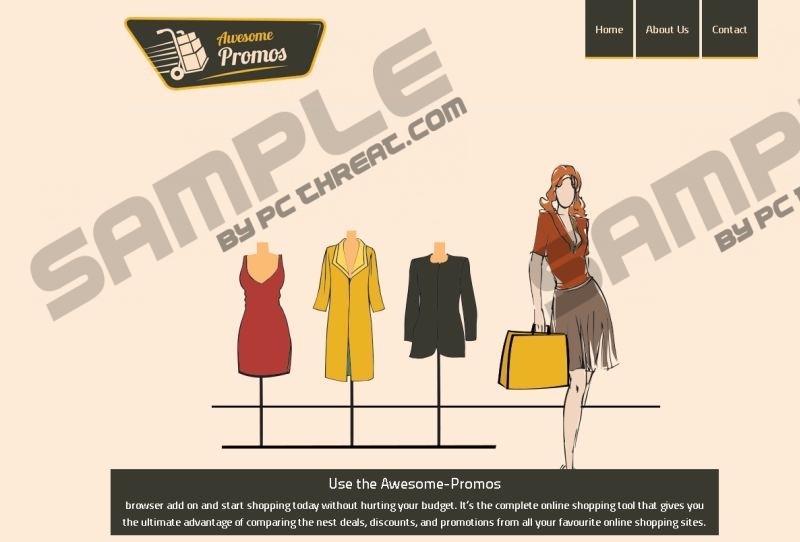 What you will find at awesomepromos.org is more like a very dull, simple, and non-functioning page; at least, you cannot download the application, and we do think it should be a function of an official website. This should raise a red flag right away because it already questions the reliability and intention of this add-on. However, if you cannot download it, there has to be another way for it to spread because, otherwise, it is no use to its developers. That is why it is distributed in third-party installers, such as InstallRex, which is infamous for including malware infections in its packages. It is very unfortunate to download and install such a bundle because you might lose control of your system and soon you might not be able to handle the situation manually. Therefore, you should delete Awesome-Promos right away and use an online malware scanner to see if there is any other threat on-board. This adware is known to come with other infections, including Websearch.hotfindings.info and Oursurfing.com, which are both browser hijackers. If these have sneaked onto your computer, you can already see the result in your browsers as they make obvious changes to the settings. Awesome-Promos is built on the JustPlugIt engine and is only good for one thing: to display commercials. However, this adware can also collect information about you and use this to send targeted ads to your screen. Since this information can also be shared with third parties, it is possible that schemers are behind certain ads, but you will never know which ones. Clicking on such ads could cause you even more trouble as you might even be scammed if you land on a fake online shopping site, for example. You need to remove Awesome-Promos if you want to protect your PC. This is what you can do to restore the health of your computer: First, you need to uninstall the program via Control Panel and then, you need to remove the browser extensions from Mozilla Firefox and Google Chrome. If you are not familiar with these steps, please follow our instructions below. Remember that your computer cannot be totally safe until you run a malware scan and eliminate all threats. For that, we recommend using an authentic antimalware program, such as SpyHunter. Press the Windows button on the Taskbar and go to Control Panel. Click on the undesirable program and press Uninstall. Click on the undesirable program and press Remove. Quick & tested solution for Awesome-Promos removal.